Support even the heaviest of climbing plants with this robust Gothic-style obelisk. 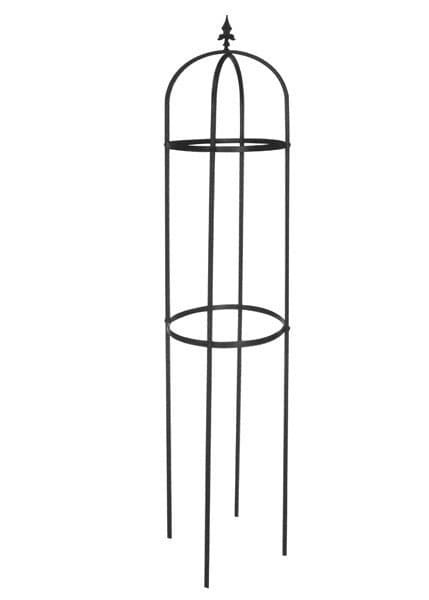 Made from heavy gauge flat and tubular steel, the obelisk is finished in antique black polyester paint to give it the appearance of classic wrought iron. A fleur de lis finial adds a decorative flourish. The obelisk is heavyweight enough to need no extra support. Push the spikes firmly into the ground and train up roses, clematis, honeysuckle or other climbers to create a dramatic standalone feature. Looks great individually or in clusters, in borders or along the edge of the patio. Supplied with a lifetime guarantee for metal components (1 year for paint work).